VELUX is offers UK customers rewards every time they buy white-painted roof windows and flat roof lights until the end of October. A maximum of £65 of VELUX rewards are available for products bought by October 31 (rewards must be claimed by 17 November). The rewards are redeemable at John Lewis online, M&S, Argos, Pizza Express, Thomas Cook, Ticketmaster, and Curry’s PC World. 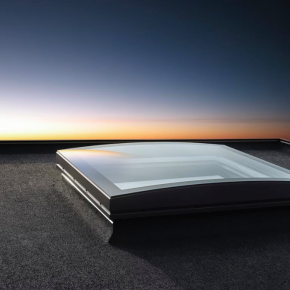 The curved glass top of VELUX’s new curved glass roof lights lets rainwater completely drain off. Eight different sizes of flat roof lights provide homeowners with flexibility and variety to match their room size. In addition, installers can claim £25 rewards for every white-painted roof window purchased. “We have timed the offer to coincide with autumn, which is traditionally a busy time for installers who like to take advantage of the better weather to carry out renovations and home improvement projects on behalf of homeowners,” Richard adds.